"I like my job and the career prospects I have. I have a loving family too. But I just feel sandwiched between the two. It is difficult to manage both of them equally well because I end up spending more time and energy at work. I feel guilty I have very little time for my family for whom I work." You are not alone in your pursuit of balancing work and home. A typical Indian household still revolves around women and as a daughter/wife/mother you are expected to keep hearth even if you are busier than your partners or other family members. Some women are even required to plan careers around the needs of their household. While they have to work harder to prove their commitment at work, they suffer from a sense of guilt at not being able to give as much time and attention to their family as they would have given if they were a homemaker. This difficulty is magnified when women have young children to care for. Society puts unrealistic expectations on women to be "perfect" mothers, homemakers, and highly productive employees too. Many women confess that while they are doing justice to their roles, there comes a point when their individual identity is lost. The fact is simple. There is simply no 'me time'. Women are afraid to express their feelings and concerns for fear of disturbing the peace at home. • Have realistic expectations of what you can contribute at work and at home when you don't want to give up either. • Be strict in maintaining a divide between work and private life. • Share and treat responsibilities at home with the same urgency and importance you give to projects at work. • Aim for high standards of efficiency, however, avoid being driven by perfectionism. • Plan and schedule your time both during your work and at home. • Plan your activities on weekends just like you plan it on weekdays. 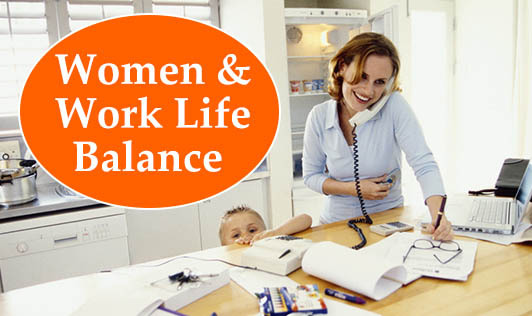 • Speak to your manager about your commitments and ask for their support in improving your work-life balance. If you are happier with the balance then it's likely that you'll be a more productive and efficient employee. • If you are having a busy period at work, let your family know and agree to spend some time with them when the busy period is over. Stick to this agreement even if it's difficult. • Negotiate responsibilities with your partner and divide household responsibilities fairly. • Spend quality time with your family. Experiment with turning off the television and instead cook a meal together, play some games, or get involved in a project together such as gardening or joining a class. • Do not hesitate to take the help of your extended family in childcare. • Be assertive and do not bite more than you can chew. Delegate tasks when it is necessary both at work and at home. • Don't feel pressured to always be doing something. Taking time to relax together can also prove valuable. • Appreciate yourself for who you are, for you make important contributions to the life of people around you. Remember, not everyone can step into your shoes and balance work and life the way you do!